I mentioned in my post about crojo that one of my tried and tested ways of getting back into the swing of crochet after a temporary loss of interest is to try a different craft. The thing about trying out new crafts is that sometimes it can be a bit scary! I know what I’m doing with crochet, and even though some patterns or techniques can be a challenge (most of my challenges come from trying to count stitches with a cat shouting in my face, but still), I’m confident that I can tackle most of what crochet has to throw at me. When I decide to give a new craft a go, I have none of this bravado – and this is where the crafting fear kicks in. The fear can be paralysing. Let’s use my current “new craft” as an example. Is it any wonder I’ve always been terrified of this? Look at all those needles! So, hands up, I’m not much of a knitter. Technically I’ve been knitting for longer than I’ve been crocheting and I’ve only just worked out how to not drop everything on the floor every time I try and purl. 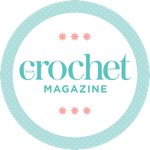 Even so, I still knit now and again – I like knitted fabric’s thinner texture than crochet or Tunisian crochet, I love the look of stockinette stitch, and sometimes it’s nice to not have to snap back “um, it’s CROCHET” when someone asks me what I’m knitting! Over the course of my knitting career, I’ve made myself one jumper, several scarves, some unattractive and unwearable hats, a baby cardigan and 10 rows of a blanket (at this rate it’ll be finished by the time I’m 80 – and that’s only because it’s in super bulky yarn). Hardly illustrious – this is why I blog about crochet, not knitting! In light of my lack of knitting prowess, I have spent a lot of time being utterly terrified of double pointed needles. I struggle to keep two needles under control (a large part of my move to crochet was motivated by having to juggle one less stick! ), so I had no idea how I would manage four of them – with extra points! I’ve seen knitting with double pointed needles described as wrestling with a hedgehog, which didn’t help to ease my mind. I spent a long time in the terror phase, and I assumed I’d never manage to knit a pair of socks. So I bought a set of double pointed needles and decided to knit a pair of socks. I’ve given myself no get-out – I’m using my fantastically beautiful (and expensive) Madeline Tosh yarn. The one I thought was too special to waste on a crochet shawl I didn’t love when I last blogged about it. Let me give you a little reminder. I still can’t quite believe I’m using sock yarn to actually knit socks! Oh it’s pretty. It’s so pretty. It probably deserves more out of life than being put on my feet, but on my feet it will go! I didn’t even know where to start, and then I remembered that lovely Lucy at Attic24 had been knitting socks recently, and recommended a tutorial by Christine over at Winwick Mum. Trusting Lucy’s judgement paid off for me once again when I went to check out Christine’s tutorials. They are incredible – she goes through each stage of making a sock on three different sets of needles, which is so helpful (and needed for a total novice like me!). And I swore a bit, and I dropped some needles, and I dropped some stitches. But I picked them back up, and I carried on. I battled through the ribbing at the top of my sock with some inelegant yarn flinging and dodgy tension. I wrestled that hedgehog, and I wrestled him good. I moved on to the leg with a sense of relief, only to discover that my terror was translating into tension. I usually knit pretty tightly but at moments this was getting crazy. So I tried to relax a bit. I got into the swing of it. I couldn’t put it down – I was knitting on the train, at my desk, on the couch and until long after I usually go to bed. Everyone talks about turning the heel of socks like it requires a PhD in knitting. It’s the one thing you’re asked when you tell people you’re knitting socks, “have you turned the heel yet?” or “I fancied sock knitting but I didn’t want to turn the heel”. I was fully convinced I’d give up halfway through and throw my needles to the floor in a fit of rage. I started turning the heel, filled with terror. And then, it was fine! It was actually… quite easy, and really satisfying. I’ve never managed to knit in 3D before, always having sewn up if I’ve made garments – seeing my heel emerge from my knitting made me crazily proud of myself. I was so proud of my turned heel I had to photograph it on the train! Look! I managed the gusset with relative ease. The heel had changed my whole attitude to the project – I was indestructible, I had managed the dreaded heel turn. The foot flew by in a whirlwind of clicking needles, and before I knew it I was on to the toe. Halfway through the foot here – so into it I was knitting at my desk! After the heel and the gusset, the toe didn’t scare me – I had faced my fear head-on, and I had conquered it. And lo and behold, I have one whole hand-knitted sock! Look at it! It looks like a real sock that a real knitter would have made! Dear sock, to me you are perfect. All I have to do now is knit one more sock – but this time, I have no fear. It’s a nice feeling. I’m already past my second heel! This one is going much faster than the first – I’m in the swing of it now! Some things are cliché because they’re true! I spent years – about 5 of them – being completely terrified of knitting socks. I doubted my abilities to such an extent that I spent 5 years just assuming I couldn’t do it. I was convinced that if I tried I would be rubbish and I would give up and be so embarrassed I’d never tell anyone about it. But look what happened! I loved every second of knitting my first sock. It was completely absorbing – a bit of a challenge, but incredibly rewarding and a huge confidence builder. It’s not perfect by any means, but mistakes are just proof that it’s handmade! In fact, I’m so into sock knitting I’ve already made a start on my second pair, this time using some short circular needles. Sometimes, conquering a fear is the best way to find a new passion. I now remember that I used to be a bit scared of crochet, and now I think it’s fair to say I’m not! For me, crafting fears stem from a keen interest in something – I’m scared of things I desperately want to be good at. Letting the fears put me off trying new crafts is very much just a waste of time. So, in the spirit of tackling crafting fear, next up – Quilting!! Well done for conquering this fear – I hope I get to this point eventually! Your sock looks fantastic btw! I have that fear. I’m terrible at following patterns so I can’t even bring myself to sit down and try a more complicated project than knitting a straight scarf, for example. Anyway, thank you for sharing at The Really Crafty Link Party, hopefully your post will inspire more of us to try something new. I am so rubbish when it comes to anything crafty! I wish I could knit, I would love to knit socks for all the ones that the washing machine eats!